The Great South Bay is one of Long Island’s magnificent summertime playgrounds. A haven for boaters, bathers, and sport fishermen. A source of endless fascination for kids. And in the biting cold of winter, a place for coffee and contemplation near the water’s edge. Looking east from Nicoll Point in Heckscher State Park one might think the bay is endless. Its calm surface extends as far as the eye can see eventually narrowing down to almost nothing at the Smith Point Bridge in Moriches. Looking west the eye stops at the Robert Moses Causeway Bridge way off in the distance, but the Great South Bay doesn’t end there. It stretches about 6 more miles beyond the bridge and into Amityville before its name changes to South Oyster Bay. And that’s just a name change. The bay continues 4 more miles before ending at a series of small islands in Seaford. Looking dead ahead or south east is Fire Island. On the horizon and almost 4 miles away, Fire Island is the only thing that gives a sense of limit to the glorious Great South Bay. 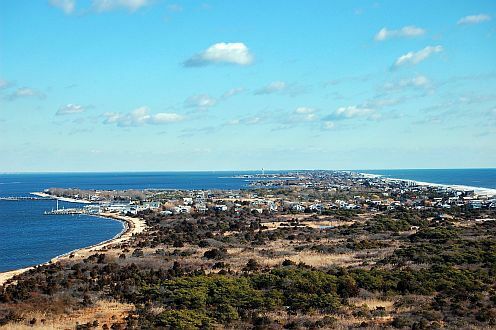 Indeed, at 26 miles long and about 3 miles wide the Great South Bay is the largest bay on Long Island’s south shore. As one might expect a body of water this size is a significant part of life on Long Island. Thousands enjoy it for summer recreation, it supports a thriving marine transportation industry, and a few stubborn baymen still earn their living on it. At 151 square miles the Great South Bay is the largest shallow saltwater bay in New York State. 5231 gallons of fresh water flow into the bay every second. 11% of that, or 575 gallons comes in directly through the bay floor. 85 species of fish have been identified in the bay, 40 of which are present on a regular basis. Average depth is 4 feet,3 inches (4' 3"). The bay is about 20' at its deepest. Eelgrass is the most common seaweed found in the bay. The history of the Great South Bay is as interesting as it is disturbing. It’s been a source of food since the beginning of time and the baymen’s livelihood for almost as long. At one time half of the nation’s clams were harvested here, but over harvesting and pollution from suburban development have almost completely wiped out the clam population. During the peak years in the late 1970’s you could almost walk across the bay from clam boat to clam boat. By the mid 1990’s you’d still see a few clammers working. Just a few years later, they were all gone. Drive across the Robert Moses Causeway Bridge today and you won’t see a single one. Blue Points Oysters, and scallops were large fisheries as well. The Blue Points died out when hurricanes blew holes in Fire Island letting seawater in from the Atlantic which increased the bay’s salinity beyond what the oysters could take. The bay scallops are also very scarce and unpredictable now. Wiped out by brown tides in the 1980’s they were gone for years. Then there was a pretty good harvest in 2006/2007, but nothing since then. None of the baymen I’ve spoken with knows why they come and go like this, but bay scallops are a real treat when they are around. But it’s not all bad news. 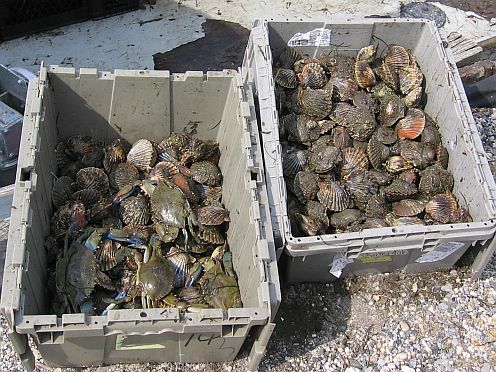 The Nature Conservancy has been restocking clams in key areas of the Great South Bay and has managed to increase the clam population significantly. I’ve also heard from some baymen that they’re seeing an increase in clams in unseeded areas of the bay as well. Since clams are a foundation species in the bay this is great news. Because of their filtering capacity (each clam filters about 1 gallon per hour) in large numbers clams influence and stabilize the food chain. The more clams, the healthier the bay. 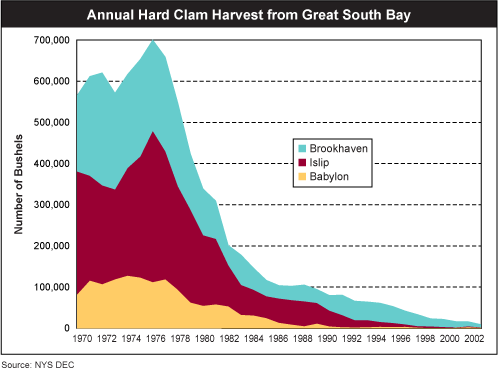 Clams once filtered the entire Great South Bay once every 2.5 days. At current population levels it takes 100 days to filter the bay. And that’s not nearly enough to do any good. If all goes well the Nature Conservancy’s goal to have the clam population restored to sustainable harvest levels by 2020 will be met, and hopefully we’ll see a healthier bay and be enjoying those fresh Long Island clams again. Maryland is famous for its blue claw crabs, but did you know that some of those crabs come from the Great South Bay? 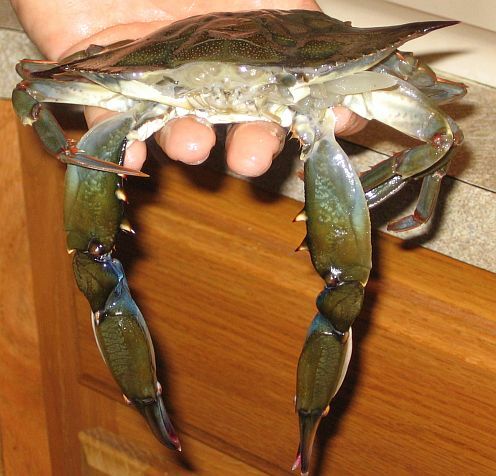 Blue claws are plentiful in the Great South Bay and when Maryland is running short they import crabs from Long Island. In addition to the blue claw crabs fishermen are pulling in bluefish, flounder, fluke, striped bass, weakfish, eels, blackfish, spearing (floured and fried whole you can eat them like French fries), blowfish, etc… If you see any of these fish in a restaurant ask where it’s from. If you’re told the fish is “local” it could very well be from the Great South Bay. The bay also produces a lot of baitfish. 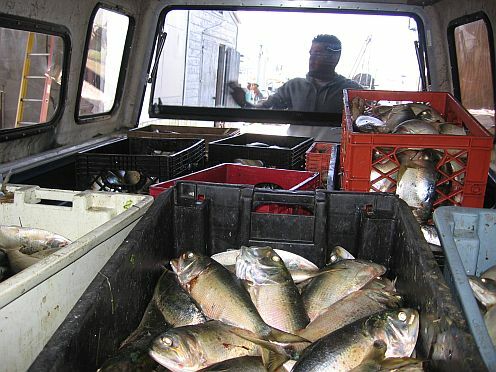 Bunker (also known as mossbunker and menhaden) are plentiful and are used for bait and fishmeal. Horseshoe crabs collected during springtime full moons are used for bait and medical research. Spearing is used as bait for snapper fishing, and killies (sometimes called minnows) are good for fluke. If you’ve ever noticed small fish swimming in the shallows you’re seeing spearing and killies. You can catch some of these small fish yourself just by kicking them out of the water and on to the beach with your feet. Put them on a hook and you’ve got bait. Put them in a pan with some eggs and you’ve got breakfast. The Great South Bay’s northern coast, which is the south shore of Long Island, is suburbanized marshland dotted with sandy beaches. Some of those beaches are part of private homes, others are protected areas that off limits, and some are town beaches that are open to the public. Every south shore town seems to have a beach. There’s Tanner Park in Copiague, Green Park in Lindenhurst, Marina Park in West Islip just to name a few, and Corey Beach in Blue Point notable for deliveries by Flo’s Famous Luncheonette. Most of these beaches have concession stands, bathrooms, and lifeguards, and some have playgrounds for the kids as well. I like the town beaches. They’re small, easy to get to, and perhaps a little quieter than the state parks like Jones Beach. And, beaches on the Great South Bay have much smaller waves than the ocean beaches making them a lot safer for kids. Your local town hall is the best way to find out about beaches in your area. 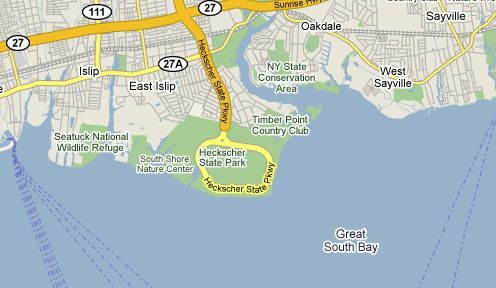 Heckscher State Park in East Islip, which hosts over a million visitors a year, is the largest beach on the Great South Bay. It’s tip, Nicoll Point, offers unobstructed views of the bay for as far as the eye can see. This park is open to everyone, and in addition to its beaches offers camping, picnic areas and 20 miles of hiking trails. There are also ball fields, swimming pools, and a boat ramp. The park is a popular launch point for wind surfers and jet skis, and there’s a field set aside for remote control airplanes that even has a paved runway. Because of its large size and shady picnic areas Heckscher State Park is also great for company picnics and family reunions. Surprisingly, what you won’t find on the beach here is a food concession stand, so you’re on your own when it comes to food and drink. I’ve spent a lot of time in this park and like it a lot. There are plenty of beaches along the Great South Bay’s perimeter, but the king of them all is Fire Island. Bounding the southern edge of the Great South Bay this 30 mile long needle of sand is home to some of the finest beaches and most beautiful communities in the world. Its southern shore is one continuous beach facing the Atlantic. Its north shore is on the Great South Bay and is home to 17 waterfront communities hosting an assortment of fine shops, bars, and restaurants. Close to a million people visit Fire Island each summer seeking what only Fire Island has to offer. Here you’ll find anything from the perfect solitude of a deserted beach (clothing optional), to the wildest nightlife imaginable, and everything in between. History buffs and sightseers will enjoy the Fire Island Lighthouse. This 168’ tall lighthouse was built in 1858 and is still an active navigational aid. The lighthouse is open to the public and offers spectacular views of Long Island, Fire Island, and the Great South Bay. While you can drive over the Great South Bay to the parks on either end of Fire Island, motor vehicles are prohibited outside of these areas. 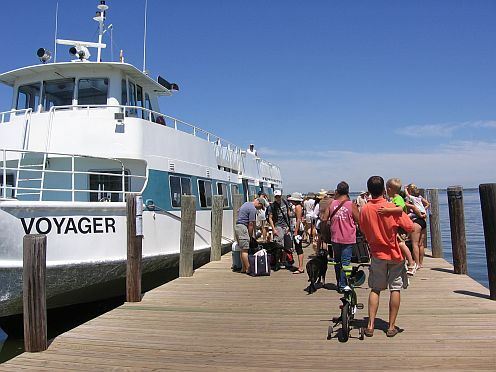 To get anywhere else you can cross the bay on your own boat or ride one of the Fire Island ferries. There are three ferry companies operating on the bay with terminals on Long Island in Bay Shore, Sayville, and Patchogue. From these ports you can get to any of the towns on Fire Island. Once on Fire Island you can get around on foot easily enough, but the island is 30 miles long. If you need to go more than a mile or so then the Fire Island Water Taxi is highly recommended. Cruising the Great South Bay at break neck speeds the water taxi is an exhilarating ride that will get you anywhere fast. One would expect large bodies of water to harbor fish of all kinds, and the Great South Bay is no exception, so if you like to fish, this is the place. Fluke, flounder, stripers, snappers, blackfish and weakfish are commonly caught, as are eels, skate, blowfish, bluefish, sand shark, and sea robins. You might turn your nose up at some of these other fish, butthey are very good eating and I always keep and cook dogfish and skate. You don’t need a boat to fish the bay. You can fish off the dock (again too many to list here, but every south shore town on Long Island has public fishing piers), or take a party boat out of Captree. Crabbing and snapper fishing are also popular pastimes on the Great South Bay, and if you know where to go you can still find some clams. For tips and tricks have look at Fishing the Long Island Coast by Tom Melton, editor of The Fisherman. Held annually at Shorefront Park in Patchogue, The Great South Bay Music Festival is a summertime favorite for Long Islanders. This 3 day festival features live music on 3 stages performed by 30 some-odd bands representing almost all genres of music. Shorefront Park overlooks the Great South Bay which means the air is fresh and view is spectacular. Bring a sweater though, because even in the summer the breeze coming off the bay can chill you to the bone. There’s not nearly as much going on during the winter on the Great South Bay as there is going on around the bay. The boaters and fishermen have all gone home, the familiar red and green buoys have been replaced with small winter markers that are less prone to ice drift, and the beaches are empty save the occasional beach comber and ever-present gulls. A sharp-eyed observer might see some small boats dredging for scallops, or larger vessels dragging for sleepy crabs hibernating in the bay bottom. You might see a police, fire, or Coast Guard boat speeding by, a freight boat delivering goods to Fire Island, or a lone white sail tacking in the breeze. Or you might not. The Great South Bay is not a busy place during the winter. But the parking lots around the bay are another story. Endless streams of cars, in and out all day and all night, carry people seeking the kind of contemplative solitude only a body of water can offer. I’m one of these people. Maybe you are too. Park by the bay with a cup of coffee on a bitter cold day. Rain, sun, fog. It doesn’t matter. There’s just something about the water, and about looking out over vast nothing that soothes the soul in ways that defy explanation. 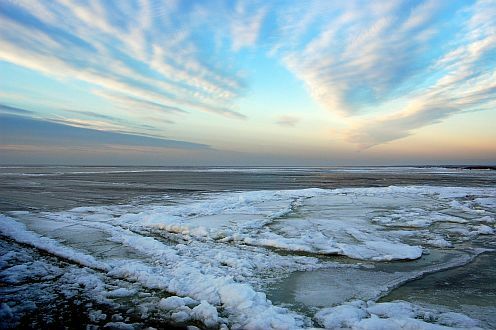 Winter on the bay: ice as far as the eye can see. The Great South Bay will always be a part of Long Island’s culture, history and economy, and a big part of many a Long Islander’s life. If you have a tale to tell about your adventures on the bay, please share it with us so everyone can enjoy it. Have A Great Story, Fond Memory or Special Photograph You'd Like to Share? If you love the Great South Bay as much as I do I know you can't wait to share your wonderful experiences here with everyone.